I have a 1993 Ford Ranger 4x4, 4.0 V6, 5 speed manual transmission. Speedometer started acting strange about 6 months ago. So I was using my Garmin to judge my speed. When I was doing 50 mph on Garmin it would fluctuate between 35 and 50 mph on the speedometer, also I could not set the cruise control. Then just before Christmas it totally quit working. Was told by a few people that it could be that the speedometer was bad, which in turn probably made the speedometer cable go bad. On January 5th, I got a speedometer from a salvage yard, They guaranteed it was good, and bought a new repair-a-cable from autozone. Switched out the cable and speedometer and replaced all dashlights while I had it apart (a few were bad before I started) Now the truck won't start by the key but it'll run if we push and pop the clutch. Going out today and take everything back apart, to make sure I didn't forget to plug something back in. Is there anything else that could cause the problem? Does that mean starter motor doesn't work? Does it mean starter motor works but engine won't start up? 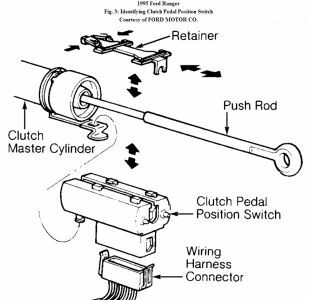 In the cab on the Clutch pedal Push rod is the Neutral Safety switch, the clutch pedal has to be pushed down to Close this switch, this switch passes the 12volts from the ignition switch(in START) to the starter relay in engine bay that activates the starter motor. The Pink wire changes to a Red/blue wire at the firewall so you will see the small red/blue wire at the starter relay(solenoid) on inner fender or on the starter motor itself. Last edited by RonD; 01-07-2019 at 10:06 AM. Yes starter won't turn over, all it does when I turn the key I hear one click and starter does nothing. As I said we pulled truck and got it running by popping the clutch and everything works except the starter. All guages work fine, all lights in dash, tach works, I drove truck about 10 miles to make sure battery was charged. When I got home, shut off truck and tried to start and all I got was one click. Also I noticed that the light for the 4x4 button was not on. When the truck is running and not in 4 wheel drive, the light is dimmly lit, then when the button is pushed it lights up bright to show it's engaged. I was wondering if I forgot to put the harness back on, could that be the reason the truck won't start because the computer doesn't get a signal from the switch? No, 4x4 system has no connection to engine computer(PCM) in any year Ranger, it has its own separate system, and computer has no connection to starter system. 4x4 lights should both be OFF in 2WD, no "dim light"
Last edited by RonD; 01-07-2019 at 11:16 AM. Replaced spark plugs, won't start. Incorrect jump start. Truck won't start now.